Chunn signed a reserve/future contract with the Cowboys on Monday. 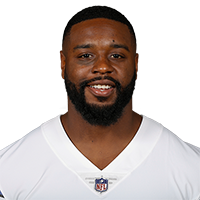 Analysis: Chunn signed a contract with the Cowboys in May of 2018 as an undrafted free agent but did not factor into Dallas' running game following the preseason. The 6-foot running back will look to make a larger impression during 2019 training camp as he tries to crack the 53-man roster. There are no videos available for Jordan Chunn. Click here to view all videos.